UPDATED: Thu., Nov. 16, 2017, 4:34 p.m.
After big win, Eastern Washington faces another tall task Friday night. Fresh off a landmark 67-61 nonconference win at Stanford, the Eagles face another physical team Friday night at UNLV. The Runnin’ Rebels are anchored in the paint by 7-foot, 250-pound freshman Brandon McCoy, who had 25 points and 18 rebounds last week in a 108-66 win over Florida A&M. On Wednesday, McCoy had a double-double with 15 points and 11 rebounds in just 21 minutes against Prairie View. UNLV won that game 98-63 to improve to 2-0 going into Friday’s game, which is part of the undercard schedule for the fourth-annual MGM Main Event at the T-Mobile Arena. “We’re playing against another great big guy, and he might be a one-and-done player, at least that’s what some are saying,” Eastern coach Shantay Legans said Thursday from Las Vegas. “They also have some of the best junior college players in the country and have a great 2-3 matchup zone,” Legans said. Eastern (2-1) had mixed success against big men this week. 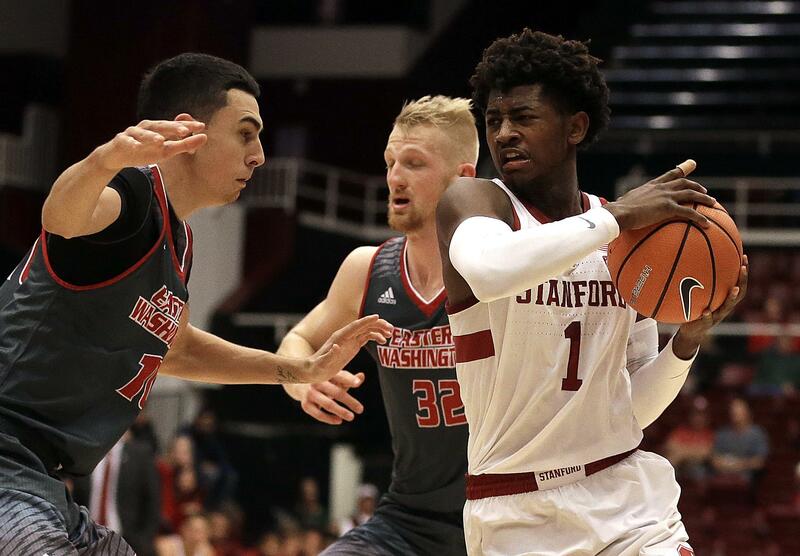 The Eagles gave up 28 points and 22 boards to Washington’s Noah Dickerson in a 79-69 loss Sunday in Seattle, but they held their own against a big Stanford frontcourt. The Eagles are in the midst of a stretch of 36 straight days without a home game – one of just four NCAA Division I teams with such a stretch this year. Eastern will continue its road trip with four games – three of them played in Las Vegas and the other at Utah – before returning home on Nov. 25. Published: Nov. 16, 2017, 2:29 p.m. Updated: Nov. 16, 2017, 4:34 p.m.